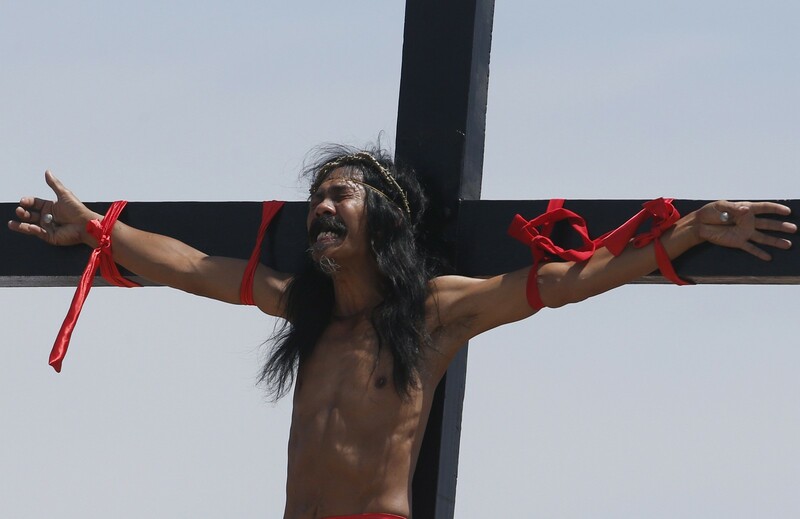 Penitent Ruben Enaje, in his 28th year of crucifixion, grimaces as he is nailed to the cross, in a re-enactment of the death of Jesus Christ on Good Friday in San Fernando, Pampanga in northern Philippines April 18, 2014. 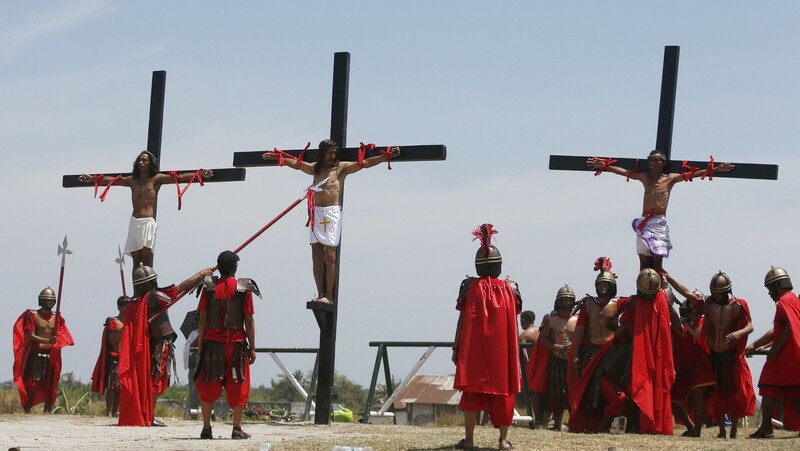 CUTUD, Philippines - Nearly 20 Filipinos and a Danish filmmaker were nailed to crosses to re-enact the crucifixion of Christ on Good Friday, a practice the Roman Catholic Church frowns upon as a distortion of the Easter message. 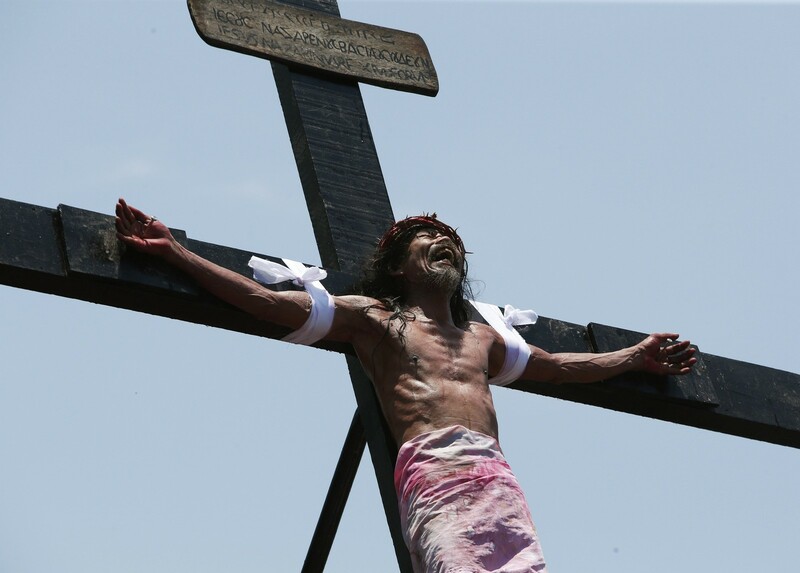 The annual Philippine ritual draws thousands of spectators to San Fernando, 80 km (50 miles) north of Manila, to see penitents flagellate themselves and a series of crucifixions in a recreation of Christ's death on the cross. 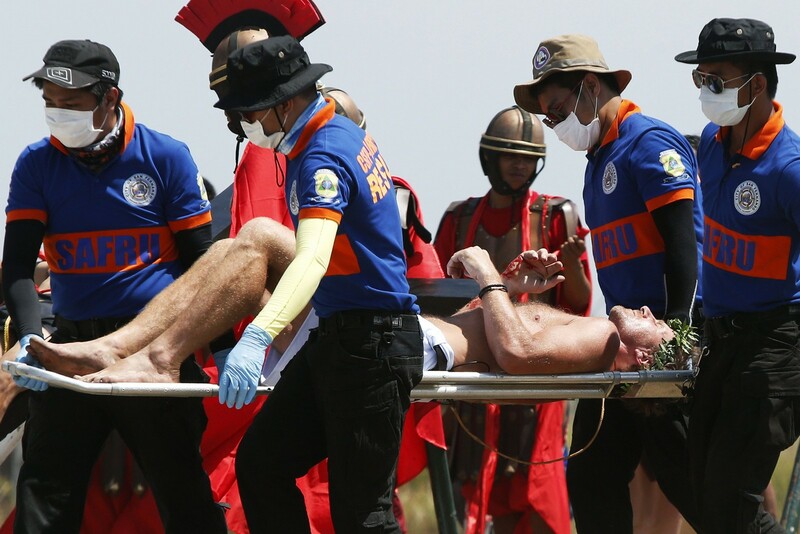 "It was a great experience between me and God," 48-year-old Danish film director and stunt coordinator Lasse Spang Olsen, who stayed on the cross for more than 10 minutes, told Reuters before being treated for his wounds. "It was great. It was fun." 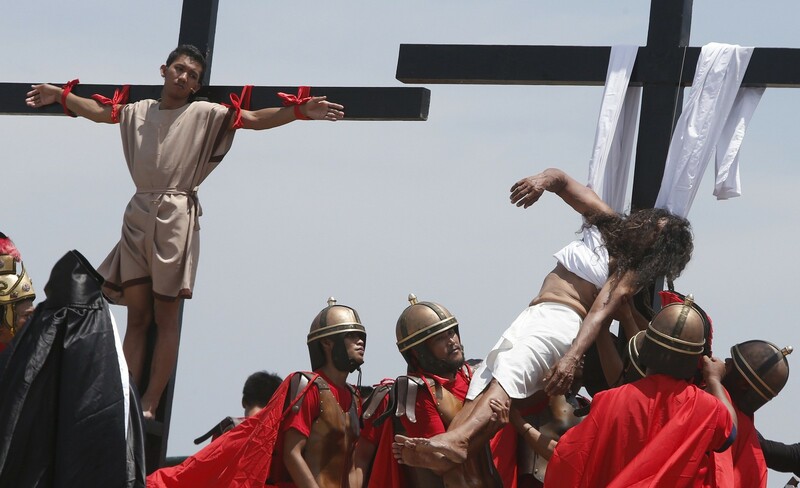 But for some in the Philippines, where about 80 per cent of the population are Catholics, the re-enactments of the crucifixion are an extreme display of devotion. Christianity teaches that Jesus Christ died on the cross on Good Friday and rose from the dead two days later, on Easter Sunday. 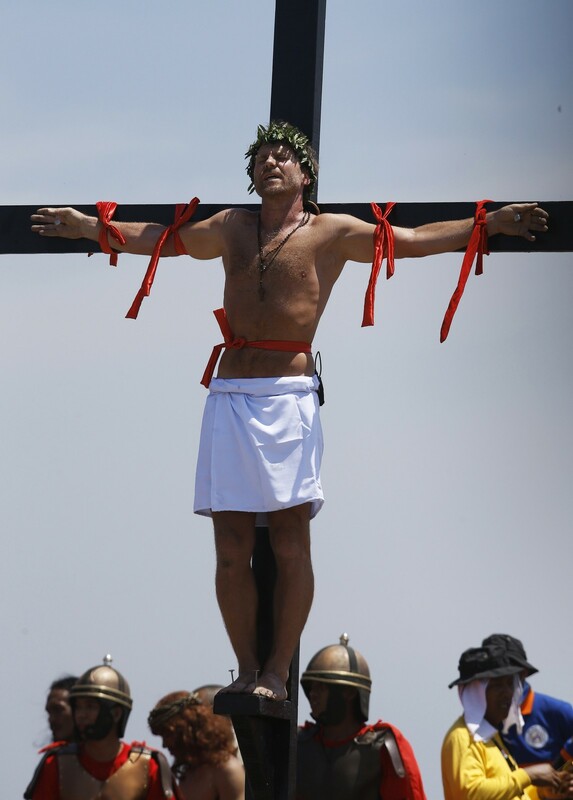 "I will do it as long as my body will allow me," said Danilo Ramos, 43, who has been crucified 23 times. "I hope God will see my sacrifice and take good care of my family." The Roman Catholic Church denounces the ritual, which took hold in northern Pampanga province about 60 years ago, as self-serving and a corruption of the message of Christ's suffering for others. "Penance does not mean you hurt yourself, because your body is a temple that houses the spirit," said Archbishop Aniceto Paciano of San Fernando. The carnival-like atmosphere in Cutud village draws thousands of foreign and local tourists each year. British casino worker Emily Ebswoth, 24, said she had never seen anything like it. "I don't like it," she told Reuters. *WARNING*: The gallery contains photos that some readers may find disturbing. Some overly graphic photos have been edited, but viewer discretion is advised. 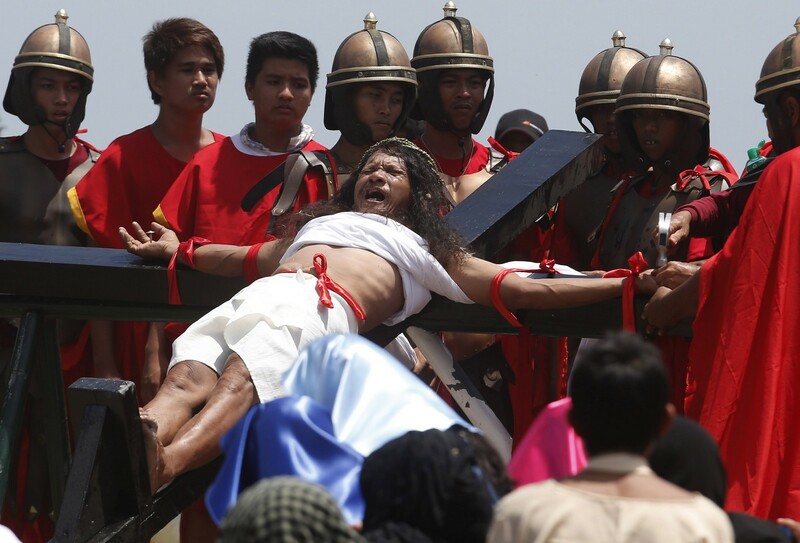 Nearly 20 Filipinos and a Danish filmmaker were nailed to crosses to re-enact the crucifixion of Christ on Good Friday, a practice the Roman Catholic Church frowns upon as a distortion of the Easter message. WARNING: This gallery contains photos that some readers may find disturbing. Some overly graphic photos have been edited, but viewer discretion is advised. WARNING: Some readers may find the following photos disturbing. Viewer discretion is advised.